Life cycle: Numerous generations each year. They go through many stages from nymph to adult and reach full maturity in about 12 days. Plants preferred - Bean, beet, chard, pea, rhubarb, and spinach. Feeding characteristics: Aphids prefer the stems and succulent foliage sucking the sap causing the leaves to wither and yellow that greatly weakens the plant. 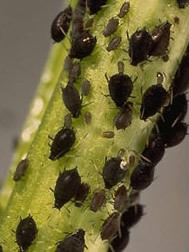 Physical characteristics: This aphid is a small (about 1/12 inch), soft- bodied insect with bluish black or dark green color. This aphid has wings that are held vertical when at rest. Controls: Adult and larvae Lady Beetles can be purchased to control infestations. Other predators of the aphid include assassin bugs, spiders, bigeyed bugs, soldier bugs, pirate bugs, syrphid flies, damsel bugs and lacewings. Intercropping plants also can be used to repel aphids. The most common is the planting of nasturtiums, garlic, chives, and other alliums, coriander, anise, and petunias. Occasionally crushing a leaf can amplify the effectiveness. If you must spray, use a mixture of one quart of water with one ounce of soap flakes dissolved to spray the foliage, rinsing with clear water when complete. A spray limewater is also effective against aphids. For serious infestations dust with sabadilla.